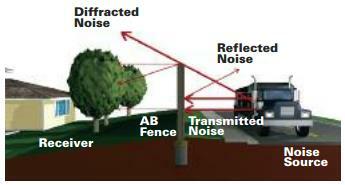 The Allan Block Blog: How is AB Fence effective as a sound barrier? How is AB Fence effective as a sound barrier? The AB Fence product is the perfect product for all your fencing needs such as screening, privacy, security and sound abatement. 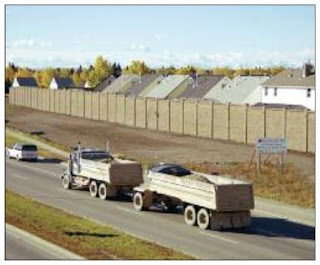 AB Fence has been used for short 3ft dividing walls to 34 ft tall sound walls around industry and along miles of interstate roadways and every height in between for every conceivable need. AB Fence is a fully engineered product with reinforced masonry posts and panels made up of 8 inch tall courses of masonry block. The structural element of the panel is the 2-course bond beams that are cast solid with horizontal rebar and vertical stirrups. One of the unique features of the AB Fence panel is the dry-stacked courses in between the structural bond beams. All courses have a ball and socket configuration which lock each course together. When using AB Fence for your sound wall needs you can find all our independent sound testing on our website. Both reflective and absorptive testing was conducted and both were perfectly aligned to grouted masonry walls as expected. 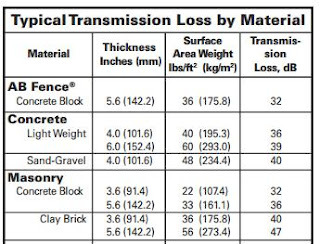 The interesting thing about the results said the researcher was that they expected that a dry-stack system, without mortared joints, would have performed much worse than a typical mortared masonry wall. But they were wrong. The unique configuration of the panel units, with the ball and socket bottom and top and the interlocking joints on each end blocks all sound attempting to travel through the joints. AB Fence is the right product for your sound wall needs. Not only providing the highest levels of sound reduction but all the proven strength of a tried and true fully engineered and tested structural system.